Spotting for Dolphins from Newhaven Port. Conducting research into local dolphin/wildlife populations through a Public Sightings Database. Studying our impacts on the marine environment. There are the species of marine mammals (dolphins and seals) that we are collecting sightings on as part of our research programme. Adults can grow to 1.9-3.9m long. They have a large grey body, a pale grey or pinkish belly and a tall sickle shaped dorsal fin. Bottlenose Dolphins are commonly seen in groups of 2-15 individuals, however large groups and single dolphins are not uncommon. These animals are playful and curious, and are often seen bow riding the waves of boats and leaping clear out of the water. Common dolphins have a characteristic figure of 8 pattern on their flanks which is tawny/yellow, brown, grey and black. They have a white belly and a sickle shaped dorsal fin. They are between 1.7-2.5m long. Common dolphins are a highly active species. They are fast swimmers and regularly ride the bow waves of boats. A large, sturdy dolphin that can grow to 3m in length. They have distinctive pale grey-white flashes along the flanks and a pale grey patch behind the dorsal fin known as a saddle patch. They have a dark grey back, tail and pectoral fins. Their dorsal fin is tall, and sickle shaped and their beak is usually although not always pale grey or white. White-beaked dolphins are fast swimmers, acrobatic and they often ride the bow waves of boats. They are most often spotted in groups of between 5-20 individuals but can form larger groups. Harbour Porpoises can grow to between 1.4 to 1.9m in length. They have a stocky body, a small rounded head that lacks a beak and a triangular dorsal fin that has a blunt tip. The body is a dark grey which lightens on the flanks and their underside to light grey or white. They are most often seen in groups of 2-5 individuals, however they are also sighted alone. Harbour porpoises are known to be elusive and will rarely approach boats. Harbour Porpoises generally travel quite slowly and tend to be sighted in relatively inshore waters and coastal regions. Harbour (or Common) Seals are commonly seen off the Sussex coastline. They can grow to between 1m-1.8m. The most distinguishing feature is that they have cat-like facial features. Their colouration ranges from light tan to brown, and with some darker speckles on their body. 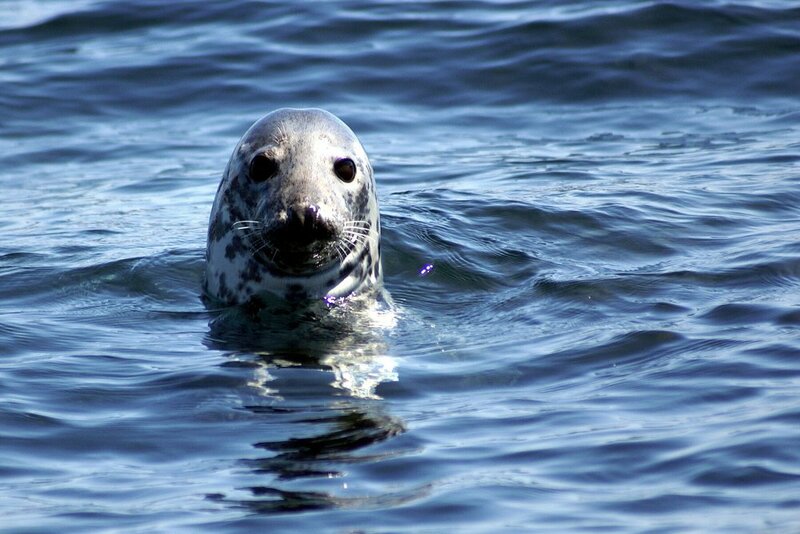 Harbour seals are mainly found in the coastal waters of the continental shelf and slope, and also commonly found in bays, rivers, estuaries and intertidal areas. Grey Seals are less commonly seen off the Sussex coastline, but are still often sighted. The larger of the 2 species of seals found in the UK, they can grow to between 1.6m-2.8m. What distinguishes them from Harbour Seals is that they have dog-like facial features, and a straight nose. Their colouration ranges from light grey to dark grey, with darker speckles on their body. Grey Seals are often found on rocky shores, and can form large colonies on sand dunes. Bow riding: Dolphins often swim in the pressure wave formed ahead of boats which are pushing through the water. Slow travel: Dolphins maintain a steady speed by only raising the upper parts of their body as they surface. Porpoising or running: Dolphins can travel at a high speed by leaping clear of the water. Chorus lines: Pods of dolphins often change direction as a unit and can swim in a line formation. Remember: Dolphins and Porpoises are wild animals. If you are lucky enough to encounter them at sea, keep your distance and be respectful. If you do see any dolphins, porpoises, or seals we would love to know, and be grateful to receive any photos and videos. This will allow us to learn more about these charismatic animals living just off our coastline! We do welcome students who are studying their Bachelors or Masters studies to complete their research dissertation project with us. If there is a particular subject that you would like to investigate, please do get in touch with details about your proposal and how it will benefit the Brighton Dolphin Project.